Much of Janis Goodman’s work is focused on structure either of inner city Leeds, where she lives or of the repetitive patterns of nature. She is as fascinated by patterns formed by roofs, walls and chimney pots as by plants, birds and trees. An interest in texture and mark making gives her work its strength, beyond the simply illustrative. She says “I like the repeated patterns in the urban streetscape of Chapeltown and Harehills and how they are broken up. I walk around the streets a lot, looking at things, and get my ideas.” Gardens and allotments also feature regularly in her work. The Gallery always has a good selection of Janis's work available framed or unframed. Please note: We post items about twice a week. Please let us know on your order if you want it urgently. these may be available immediately or take as long as 4 weeks please contact us to check! Drawing on the copper plate through the wax ground. The plate is then etched and aquatinted. Inking and wiping the plate. 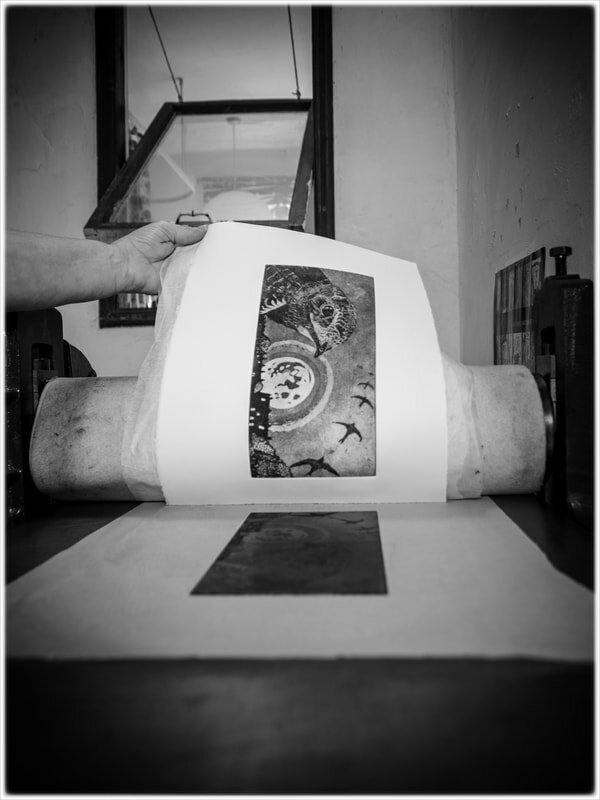 The final etching is printed on damp cotton paper before being taped dry, numbered, signed and titled.